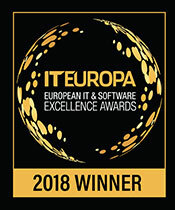 It’s official, Interys has won the Managed Service Solution of the Year at the 2019 IT Europa Awards! We are thrilled to have taken the trophy for our core Managed Service offering and beaten eight other worthy competitors (UK based and global). Our winning entry focused on our work for a major West African gold mining company and was recognised for showing a real understanding of the customer’s requirements and the ability to deliver solutions to specification and time scale while meeting or exceeding agreed goals. As part of our work, we faced unique geographical and infrastructural challenges including regular power outages, lightning strikes and even a termite attack! Our entry was recognised for giving the customer a real market benefit. You could almost say we’ve become old hands at awards ceremonies; this is the second year that we have taken part and won at Europe’s most prestigious IT event. This year we also sponsored two Supplier categories – Software Vendor of the Year and Tech Vendor of the Year. Managing Director Matthew Geyman presented the award to winners Microsoft for Software Vendor of the Year and HP Enterprise for Technology Vendor of the Year. The Intersys team was out in full force manning a table of ten. It was great to see everyone from Technical Directors to the newest members – IT Support Engineers Akinola Oyebode and Ernestas Minalgas all present and scrubbed up in their evening best. Stand up comic and Have I Got News For You favourite Hal Cruttenden was a fantastic host and kept the audience in stitches throughout the evening. He even managed to include the Intersys team in one of his routines! All in all, it was a fantastic event and here’s to many more wins in the future!